The Orient will be baptized in Russia. The whole heavenly world is praying for the enlightenment of the Orient. A time will come when Russia will be torn apart. First they will split her up, then they will start to plunder her wealth. The West will in every way try to further Russia’s destruction and hand over her eastern part to China. The Far East will fall into the hands of the Japanese. Siberia will fall to the Chinese, who will start to settle in Russia, marry Russians and eventually, through cunning and craft, occupy all Siberia as far as the Urals. When China tries to go further, the West will oppose it. As was the case with his words about Russia, we are beginning to see some of them fulfilled today. Orthodox students from the People’s Republic of China can now begin to prepare for their future ministries in China in the theological schools of the Russian Orthodox Church. Agreement on the issue came as a result of the sixth session of the Russian-Chinese working group on contacts and cooperation in the religious sphere held in Beijing on Thursday, the Vice Chairman of the Department of External Church Affairs (DECR) of the Russian Orthodox Church Archpriest Nikolai Balashov told RIA-Novosti. It is possible that China contains, for development, an alternative of multipolarity to the Washington Consensus of open-market policies promoted by the IMF, World Bank, and the US Treasury, but the way is dangerous. The Chinese bourgeoisie is growing in power and therefore in its capacity for immorality, and to follow their lead would be a worthless endeavour. Bourgeois culture, spiritually threatening to assimilate the powers that be in China to the global (Western) élite, is a challenge for the Church itself. Wenzhou, sometimes described as ‘China’s Jerusalem’,2 is a nouveau riche city with Christian bosses who rose from rags to riches; it features a capitalist Boss Christianity whose prosperous lay leaders believe they serve God by making money, running churches as entrepreneurs and running factories as Christian enterprises drawing poor labourers to the promise of a better life in Christianity. It looks like the religion of Americanism, a nihilism that grew into the global capitalism of the post-Cold War world. Will China go with a Wenzhou Boss Christianity, oriented toward the business of manufacturing outsourced from the West, and the seeking of power and glory through commerce? or will it go with a Christianity oriented toward the Eurasian continent, and the voluntary laying down of power to build neighbours up? Chinese Christianity must align not with high-finance imperialism, which breathes the spirit of Antichrist, but with those who like Burkinabé president Thomas Sankara in the 1980s are resisting that neoliberal disorder’s supremacy by struggling for independence from it. Only thus will the Church be the spiritual life of a China that takes the shape prædestined for it by God, a China that leads other nations by the strength of Christ in a common resistance against the geopolitical powers of Satan. For we wrestle not against flesh and blood, but against principalities, against powers, against the rulers of the darkness of this world, against spiritual wickedness in high places. Holy Seraphim of Vyritsa, pray for China and all the world! The time will come when there will be no persecution, but money and the attractions of this world will draw people away from God and many more souls will perish than during the period of open militant atheism. On the one hand, they will raise up crosses and gild cupolas, but on the other hand, the kingdom of lies and evil will come. . . . So many in the world are sick unto sorrow because of the way the Globalists govern. These captive peoples hunger for leadership to deliver them from their hands. Russia has been providing that leadership in some important ways, but, nevertheless, she still has an internal battle to wage, it seems. If she is to take up her role again as the Third Rome, as protector of Christians and fountainhead of true evangelism, she must fight hard, and we all must pray for her victory. Otherwise, all is lost. 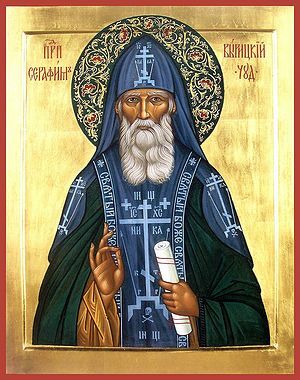 Holy Seraphim of Vyritsa, pray for Russia! Thomas the Twin, who alone was bold, and brought blessing by his faithless faith, banished misty ignorance in all the ends of the earth by his believing unbelief; while for himself he wove a crown as he wisely said, ‘You are our God, O highly exalted, our God and the God of our fathers; blessed are you’. Not in vain did Thomas doubt your Rising, not in vain declare, but he hastened, O Christ, to show to all the nations that it was undoubted; and so having through unbelief come to belief he taught them all to say, ‘You are our God, O highly exalted, our God and the God of our fathers; blessed are you’.
. . . In recent decades a trend has emerged in the location of the most religious and least religious states. As one might expect, the most religious states are in the South (plus Utah) and the least religious are in the northern corners. . . .
. . . There has been little regional change in religiosity throughout the past few decades. In our lifetime, the South has always been seen as the Bible Belt. New England and the Northwest have been less religious regions. From the numbers shown at that same page, New England is indeed the least religious section in the (artificial, unnecessary, and harmful) Union. Half-faith has many degrees, but one thing inevitably follows from all half-belief. Those who deny know both what they have denied and to what to return. But the half-believer does not have any such clarity and grows accustomed to a life guided by sophistries, half-truth, and hints at some sort of supposed truth. New England has for the most part made a full denial of the Truth. The South, however, is still clinging tightly to the tattered rags of post-Schism ‘Western Christianity’. It is the former, therefore, who are better able to embrace the Orthodox Faith: The hands of the Yankees are open, hanging by their sides in despair; Dixie’s fists are clenched shut in stubbornness and disobedience. The Yankees have wonderful patrons available to them in the two holy men who enlightened their forefathers in Old England: St Felix of East Anglia (+648) and St Cedd of Essex (+664). May they cry out to them more and more in the coming months and years! As Mr Weaver and Mr Lytle are two of the most important Southern Agrarians of the 20th hundredyear, the rooting of these monasteries in their hometowns and so near also to a major Southern cultural institution is hopefully a sign that the Orthodox Faith will not be long in spreading throughout all of Dixie. Whatever the timeline will be in the end, through the prayers of St Thomas and all our Holy Fathers and Mothers, may the Orthodox Church bear much fruit in New England, the South, and all the real countries lying within the borders of North America.